Companies transport, store and dispense many different flammable liquids using 55-gallon drums. Any one of these routine activities has the potential to create an explosive situation. In 2008, the US Chemical Safety and Hazard Investigation Board investigated a series of explosions at a chemical distribution facility. During a filling operation, static electricity built up between the hose nozzle and a tote of ethyl acetate. This created a spark, which started a fire in the tote. The fire quickly spread, causing a buildup of heat and pressure in other drums in the facility. Investigators described the disaster in these terms: "A large plume of smoke and rocketing barrels and debris triggered an evacuation of the businesses surrounding the facility." What precautions can prevent drum storage and dispensing operations from becoming dangerous? Grounding is an electrical connection between a metal storage drum and an electrical earth using antistatic wires. The connection provides a safe path for an electrical charge to leave the drum without causing a spark. Always ground drums while they are in storage and while dispensing their contents. Bonding is an electrical connection between a metal storage drum and other metal equipment using antistatic wires. It prevents the buildup of electrical charge between them by providing a path for electric current to flow. Bond all equipment used in drum storage and dispensing operations with each other. Antistatic wires are normally multi-strand wires, that bolt or clamp to the equipment in use. They come insulated or uninsulated, although defects are easier to identify on uninsulated cables. Keep connections clean and free of rust to ensure a good electrical connection. Otherwise, static electricity could still accumulate causing a spark. The two acceptable methods for drawing off hazardous liquids from drums are by pumping, or by gravity. The gravity flow method of drum dispensing uses a drum faucet. Position drums horizontally so the contents flow out when the faucet opens. The self-closing design prevents spills if someone leaves the faucet open. Self-closing safety faucets also contain flash back arrestors to prevent sparks from entering the drum and igniting the contents. Some jurisdictions prohibit gravity flow dispensing. Always check local regulations. For vertical drum storage, use the pump method for dispensing its content. The pump mounts onto the drum and dispenses the product from the drum to a receiving vessel. A variety of pumps are available. Some offer features such as self-bonding hoses as an additional safety measure. Drum venting is important for overpressure and vacuum conditions. When dispensing from a drum, the removal of liquid creates a vacuum in the storage drum. A sudden drop in temperature can also cause a vacuum due to contraction of the vapors in the drum. By drawing air into the drum, the pressure vent balances the internal and external pressure, preventing a vacuum from developing. When a pressure vent fails or is not present, a vacuum could cause the drum to collapse, resulting in an uncontrolled release and the potential for fire and injuries. In conditions of high temperature and pressure, drums have the capacity to explode. When pressure builds up in the drum, a pressure vent allows vapors to escape from the drum. This relieves the pressure before it reaches explosive conditions. Safety vents open at a pressure of 5 psi (0.35 bar) and then seal once the pressure drops to a safe level. Spills happen, especially when transferring liquids from drums. 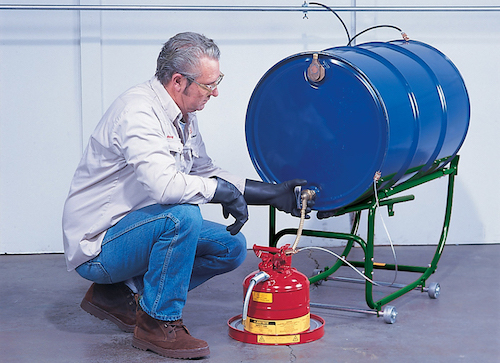 Safe drum dispensing practices include containing spills. Some drum caddies include spill containment features. Others require a spill tray underneath the faucet to catch any unintended leaks and spills. Uncontained spills cause slip hazards and potential injuries. They also create fire risks. Justrite supplies drum storage and dispensing equipment. View all our drum funnels and equipment here. Click here to view our full catalog.